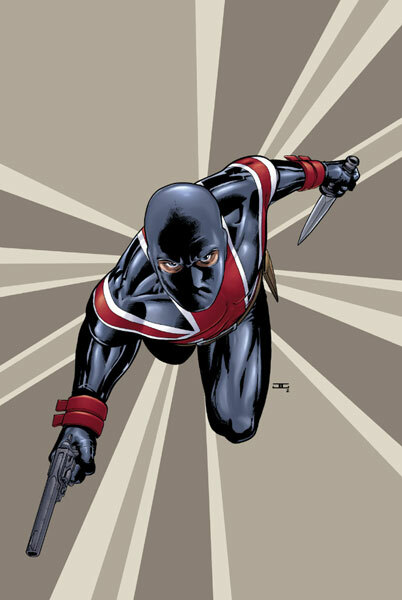 Union Jack is a character that I love the costume design but up until recently, I’ve never really read much of the character. 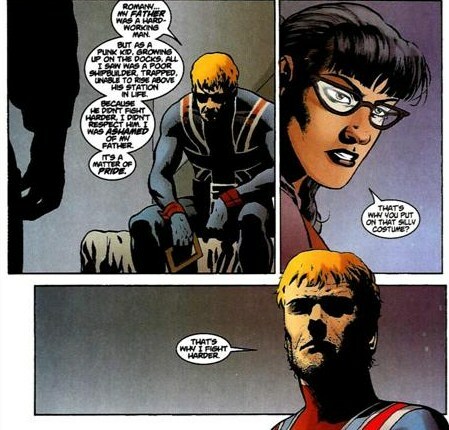 To be fair, he’s never had an ongoing series but I started into Brubaker’s run on Captain America again and really love the cameo the character makes so when I happened upon his ’98 mini-series written by Ben Raab and John Cassaday with Cassaday handling art chores it was kind of a no-brainer. Cool costume and Cassaday on art, sign me up! The story isn’t anything new but it’s told really well. Union Jack III (Joey Chapman) tracking down a mysterious vampire cult who may be hunting down the holy grail as a means to evolve themselves and possibly bring back the dreaded Baron Blood! 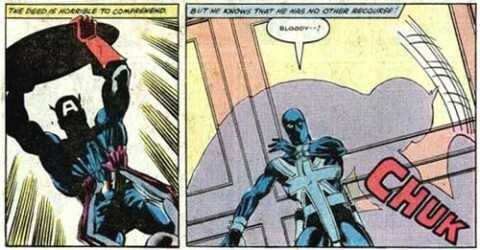 For those of you who forget, Baron Blood was part of one of the most famous Captain America panels ever. Ben Raab and Cassaday really put together a solid story. 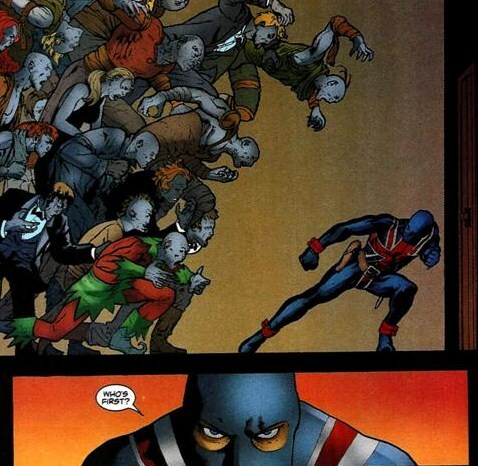 While the plot may be nothing new, they treat the characters involved with respect and do a great job of creating an everyman hero in Union Jack. Joey isn’t an aristocrat like his predecessors, he’s the son of a dock worker. He sounds like a guy you would know. I also appreciated how the dialogue is written. Every now and then, when a writer has to write a character that is British or a member of any non North American country, they tend to over do what they think is the accent or slang. In the case of British characters, sometimes they come out sounding like over exaggerated Monty Python characters than actual people. Union Jack avoids that pitfall completely. Art wise, I was kind of surprised. John Cassaday is probably in my top ten favorite artists. His work on Planetary and Astonishing X-Men is nothing short of amazing to me. It just seems so polished and smooth. When I cracked open the book, I figured it was in Cassaday’s younger days and it was going to be an interesting look at how an artist evolves. However, I was shocked to discover that this book was only done a year or two (depending on when this actually penciled as opposed to when it was published) before the start of Planetary. The transition from this to Planetary is pretty interesting to see. Union Jack isn’t nearly as smooth as Cassaday’s better known work. That’s not to say that it’s bad by any stretch, it appears that he’s trying a few things with his style that he later disposed of or toned down. The pencils don’t seem to be nearly as tight as the Cassaday we’ve come to enjoy but they still serve the story very well. The roughness even adds a little to it. The character of Joey Chapman’s Union Jack is a great mix of things for me. He’s kind of like Daniel Craig’s version of James Bond but in a costume and occasionally fights vampires. He’s the kind of everyman the reader wants to be, or at the very least have a beer with. Union Jack is a great little mini-series that I recommend. Between this series and his appearance in Brubaker’s Cap run, I’ve decided I must read more of the character and have already searched out the Stern/Byrne run on Cap that contains that awesome panel. Next week is Fan Expo and Comic Book Daily will be out in full force, myself included. 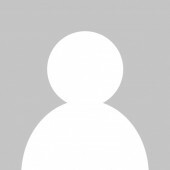 If you see me, feel free to come over and say hi… and buy me beer. People who by me beer get free positive mentions in my column. Order online: Amazon, Book Depository.